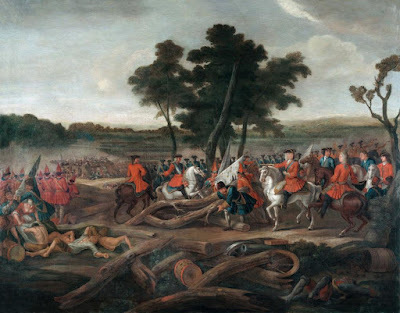 The battle of Malplaquet was fought on the 11th September 1709 between a French army under Marshal Villars (rated as the best French general of the time) and an allied army of British, Dutch and Germans under the joint command of the Duke of Marlborough and Prince Eugene. The duke of Marlborough’s last and most useless battle. After a long series of victories (Ramillies, Oudenaarde), the allied armies intended to destroy the French army and then invade France. The French main army was south of Mons, waiting behind field fortifications near the woods of Malplaquet. 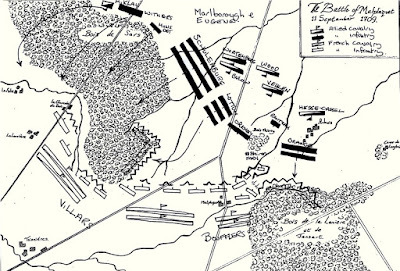 Marlborough and Prince Eugene, with their 7,500 men, intended to use the same tactical dispositions they had used formerly for Bleinheim and Ramillies, a straightforward advance on the enemy lines. The duc de Villars, commanding the French, had taken a defensive position, protected on his two wings by occupied forests forming a funnel-shaped line. The center was on higher grounds and the fortifications were defended by his elite regiments. The first shots were fired at 7:30 A.M. on the French left wing by Eugene’s troops; the wood of Sars was taken at 11:00, but the winning troops were too exhausted to follow the reforming French. The French right was attacked by Dutch troops, who were repulsed; the French commander was too cautious to give orders to pursue the hesitating Dutch. Villars had reinforced the wings from his well-defended center when no attack had been launched by noon. He wanted now to attack and gathered 50 battalions, but the British artillery covered the French front with a deadly fire. 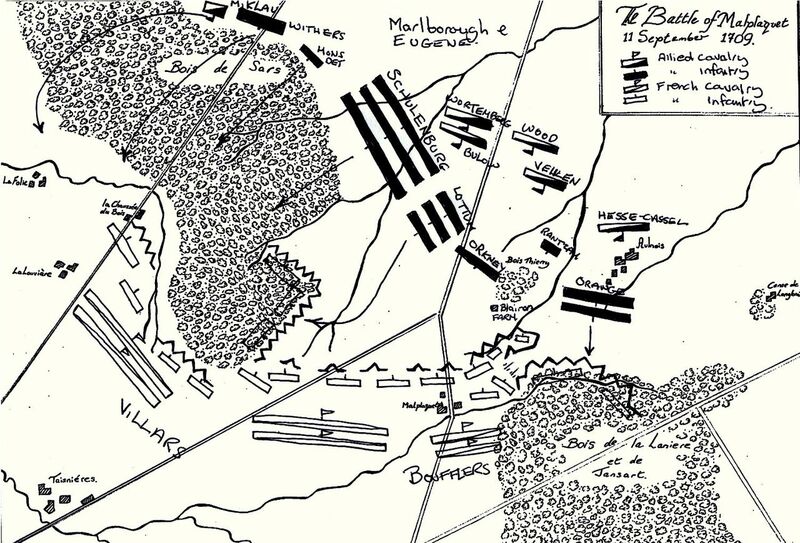 Two events turned the tide of the battle: Villars was wounded and taken away from the battlefield, and Marlborough and Eugene, seeing the weakened French center, launched a decisive attack. The fortifications were assaulted at a terrible human cost. Boufllers, now in command, ordered his cavalry to charge against the emerging infantry around 1:00 P.M., and six futile charges ensued. The French then decided to retire in good order, while the allies were too exhausted to pursue. Malplaquet was the bloodiest battle of the eighteenth century, with no fewer than 11,000 killed and 22,000 wounded. The allied casualties were higher than those the French suffered; they were unable to follow their invasion plan. Malplaquet was seen as a glorious defeat in France and raised the fighting spirit of the army. Conversely, this dubious victory gave Marlborough’s court enemies an argument to undermine Marlborough’s position, and he was recalled in 1711. It is chiefly of note because it was the Duke of Marlborough's last victory in a pitched battle, but it was the first one to bought at a very terrible cost (circa 12,000 French losses to circa 24,000 allied, though some estimates do vary quite widely). In every previous battle Marlborough had won very convincingly, but the French withdrew from this one in good order, and considered it, quite rightly, a moral victory. If they had lost this battle as badly as previous ones then they would almost certainly have lost the war, whereas instead they were able to continue until 1713, by which time Britain had had enough of the war and had pulled out of the allied coalition. References and further reading: Corvisier,André. La bataille de Malplaquet. Paris: Economica, 1997. Wijn, Jan W.“Les troupes hollandaises à la bataille de Malplaquet.” Revue Internationale d’Histoire Militaire 19 (1957), 334–379. A real pyrrhic victory, can you repeat the success of the Anglo-German and Dutch force against the French, take the Redans and drive them before you, or will you raise the hat of Boufflers and lead the counter charge of the Maison du Roi….This is a real tough battle for the allies and the French are significantly outnumbered, so take your pick and change the course of the battle! Victoria awards the day to Marlborough and Prince Eugene, as possession of the battlefield is the hallmark of victory. But they have a sea of wounded men to care for, so pursuit is out of the question; the extent of these casualties will only become apparent later in the day as they tour the battlefield together.